Fluoropyrimidines such as 5-fluorouracil (5-FU) and 5-fluoro-2'deoxyuridine (FUDR) are among the most effective chemotherapeutic agents for treatment of metastatic colorectal cancer (CRC). Increased expression of thymidylate synthetase (TS) in CRC metastases has been proposed to be an important mechanism of resistance to fluoropyrimidine-based chemotherapy. The present study investigated whether TS mRNA levels in liver metastases of 20 CRC patients before treatment with FUDR by hepatic arterial infusion (HAI) correlated with frequency of clinical response or survival duration. Median survival duration of patients with TS mRNA levels above and below the median was 15 and 18 months, respectively (p > 0.05). Clinical response was achieved in 40% of patients with low TS mRNA levels, but in only 20% of patients with high TS mRNA levels (p = 0.01). 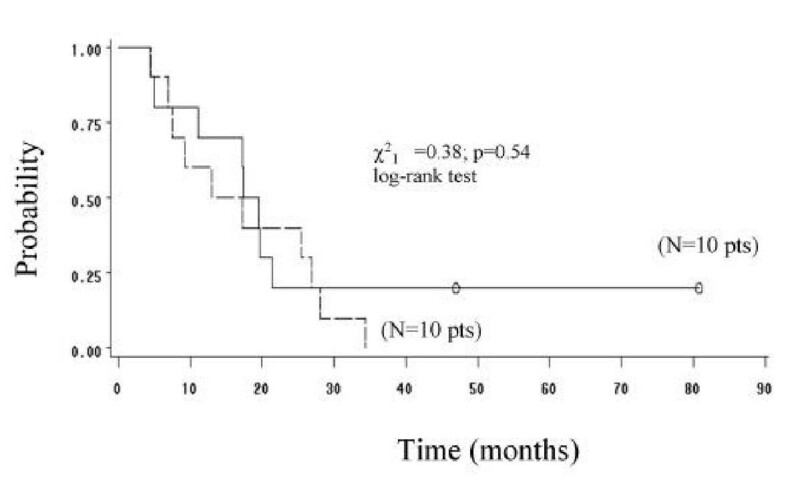 TS mRNA levels were also measured for liver metastases of 7 of the patients that did not achieve a clinical response. A statistically significant increase in expression of TS mRNA was observed for liver metastases resistant to chemotherapy (21 ± 14) in comparison to liver metastases of the same patients before chemotherapy (8 ± 4) (p = 0.03). This is the first report to demonstrate increased TS expression in liver metastases from CRC patients resistant to fluoropyrimidine based chemotherapy. These findings are consistent with previous studies indicating that increased TS expression is associated with resistance to fluoropyrimidine-based chemotherapy. Colorectal cancer (CRC) occurs commonly in both men and women of developed nations . There is a high risk of distant metastasis and local recurrence of CRC. Significant advances have been made in surgical management and adjuvant treatment of CRC patients. Adjuvant CRC therapies include local radiation and systemic chemotherapy that may be administered either preoperatively or postoperatively . Despite these developments in treatment, nearly half of CRC patients will die from this disease. Fluoropyrimidines such as 5-fluorouracil (5-FU) and 5-fluoro-2'-deoxyuridine (FUDR) are among the most effective chemotherapeutic agents for treatment of CRC. Hepatic arterial infusion (HAI) of FUDR yields a complete or partial response in approximately 40% of CRC patients with liver metastasis . Fluoropyrimidine metabolites form a covalent complex with thymidylate synthetase (TS). Formation of this complex prevents biosynthesis of intracellular thymidylate, which is essential for DNA biosynthesis. An increase in TS protein levels has been suggested to be an important mechanism of resistance to chemotherapy with fluoropyrimidines . Several studies have demonstrated that TS mRNA and protein levels of CRC metastases frequently vary among different anatomical sites of metastasis and are often significantly different from that of the primary tumor. For example, TS protein levels were higher in abdominal CRC metastases than in hepatic CRC metastases. The variation of TS expression in CRC metastases in comparison to the primary tumor supports the argument that TS expression in primary CRC tumors is not predictive of chemotherapeutic response in CRC patients with metastatic disease . The stage of disease is usually the primary factor dictating whether a CRC patient receives chemotherapy. However, it would be useful to identify factors that may predict treatment response to optimize clinical management of CRC. The aim of the present study was to determine whether response of hepatic CRC metastases to FUDR administered by HAI is correlated with TS mRNA levels in liver metastases of CRC patients prior to chemotherapy. TS mRNA levels in liver metastases were also examined after treatment in CRC patients that did not respond to chemotherapy to test the hypothesis that liver metastases resistant to FUDR exhibited increased TS mRNA levels. This study included 20 CRC patients administered HAI therapy for nonresectable liver metastases at the Centro di Riferimento Oncologico (CRO), National Cancer Institute, Aviano. Patients included in the study gave informed consent and the Hospital Ethical Committee approved of the study. The Vital-Port Vascular Access System (Baxter, Italy) was used to administer FUDR (Roche, NJ, USA) by HAI at a dose of 0.2 mg/kg per day for 14 days every 28 days. Treatment cycles continued until progressive disease (PD) was detected. Abdominal computerized axial tomography (CAT) was utilized during treatment and for monthly evaluation of treatment response. Complete response (CR) was defined as a clinical and radiographic disappearance of liver metastases. Partial response (PR) corresponded to a reduction in metastasis volume by more than 50% and stable disease (SD) corresponded to a reduction in metastasis volume by 50% or less. An increase in metastasis volume by more than 25% or appearance of a new metastasis indicated PD. Tumor biopsy specimens, collected before chemotherapy, were removed during laparotomy for implantation of the intra-arterial infusion device without substantially expanding the scope of surgery. Tumor biopsy specimens, collected after chemotherapy, were removed from patients with PD or SD by hepatic arterial cannulation of liver metastases identified by CAT after two cycles of chemotherapy. Specimens were frozen in liquid nitrogen immediately after collection and stored at -80°C. All patients provided written consent prior to collection of tumor biopsy specimens. The procedure used to quantitate TS mRNA has been described previously [6, 7]. RNA isolated from tumor biopsy specimens was used as a template for cDNA synthesis. TS and β-actin cDNA fragments were amplified separately by polymerase chain reaction (PCR). The 5' end of forward primers used for cDNA amplification included a T7 RNA polymerase promoter site. T7 RNA polymerase and α-32P-CTP were used for synthesis of labeled cRNA from amplified cDNA fragments. Transcription products were subjected to electrophoresis with an 8% denaturing polyarcrylamide gel then visualized by autoradiography. Bands corresponding to TS and β-actin cRNAs were isolated then quantified with a liquid scintillation counter. PCR was conducted with various starting concentrations of cDNA to determine the range for which the amount of cDNA template used was linearly related to the amount of cRNA product obtained. TS mRNA levels were calculated from the ratio of the slope of the linear portion of the TS curve to that of β-actin and are expressed in arbitrary units (AU). Patients were grouped either by TS mRNA level or clinical outcome of chemotherapy. Clinical response to chemotherapy was defined as either a CR or PR. A lack of clinical response corresponded to patients with either SD or PD. SAS software was used for data analysis . Survival duration was defined as the interval of time between date of treatment initiation and date of death or last contact. Survival curves were plotted by the Kaplan and Meier method . Univariate analysis of survival duration was performed to calculate Cox proportional hazard ratios (HRs) and corresponding 95% confidence intervals (CIs) . The mean TS mRNA level of patients responding to chemotherapy was compared with that of patients that did not respond to chemotherapy. In some patients that did not respond to chemotherapy, mean TS mRNA levels before and after treatment were compared. Differences between means were performed by a non-parametric test (Wilcoxon test) . The mean TS mRNA level for each group is presented together with its corresponding standard deviation. Differences in survival duration, frequency of clinical response, HR, and TS mRNA level, were defined to be statistically significant if the p value was less than 0.05 by a two-sided test. Clinical characteristics of the 20 patients studied are indicated in Table 1. The median age was 59 years and ranged from 44 to 79 years. Response to chemotherapy was observed in 6 patients. CR was achieved in 1 patient and PR was achieved in 5 patients. SD remained in 5 patients and PD occurred in 9 patients (Table 1). The median survival duration for all patients was 17 months and ranged from 4 to 81 months. The median TS mRNA level for all patients was 13 and ranged from 4 to 32. 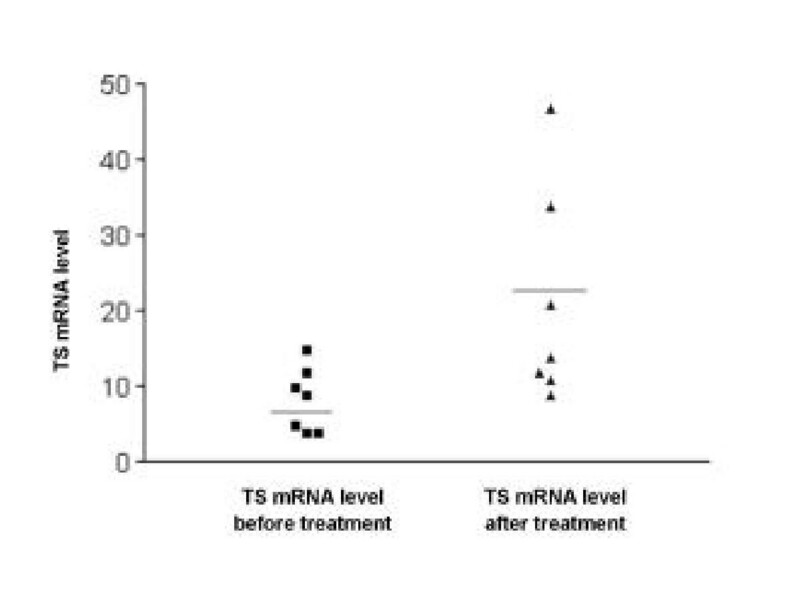 Survival duration of patients with TS mRNA levels above and below the median is plotted by the Kaplan and Meier method in Figure 1. Clinical characteristics of CRC patients with nonresectable liver metastases. * This value is expressed in arbitrary units; F, female; M, male; PD, progression disease; SD, stable disease; PR, partial response; CR, complete response; ND, not determined. Median survival duration of patients with a TS mRNA level below the median was 18 months and ranged from 4 to 81 months. Median survival duration of patients with a TS mRNA level above the median was 15 months and ranged from 5 to 34 months. The difference in survival duration between patients with TS mRNA levels above and below the median was not statistically significant. However, a statistically significant difference in frequency of clinical response was observed between patients with a TS mRNA level above and below the median (Table 2). Clinical response was achieved in 40% of patients with a TS mRNA level below the median, but in only 20% of patients with a TS mRNA level above the median (p = 0.01). Clinical response rate of patients stratified by TS mRNA level. *Clinical response is defined as CR or PR. Table 3 summarizes results of a univariate analysis of patients stratified by chemotherapeutic response and TS mRNA level. The HR for death was 3.31 for patients not responding to chemotherapy in comparison to patients that did respond to chemotherapy (p < 0.05). The HR for death was 1.34 for patients with a TS mRNA level above the median in comparison to patients with a TS mRNA level below the median. The difference in HR for death between patients with TS mRNA levels above and below the median was not statistically significant. Univariate survival analysis of 20 CRC patients with liver metastases stratified by TS mRNA level and clinical response. *Cox proportional hazard ratio (HR) and corresponding 95% confidence interval (CI). †Reference value. Patients that responded to chemotherapy had a mean TS mRNA level of 11 ± 5 AU before receiving therapy. Patients who did not respond to chemotherapy had a mean TS mRNA level of 14 ± 8 AU before treatment, which was slightly higher than that of patients that did respond to treatment. However, such differences were not statistically significant (p = 0.42). TS mRNA levels of liver metastases that remained after chemotherapy were also measured for 7 of the 14 patients that did not achieve a clinical response to chemotherapy. Liver metastases isolated from these patients exhibited a statistically significant increase in mean TS mRNA level in comparison to liver metastases isolated from the same patients before chemotherapy. The mean TS mRNA level of these patients increased from 8 ± 4 AU before chemotherapy to 21 ± 14 AU after treatment (p = 0.03) (Figure 2). Several prognostic factors have been identified in recent years that correlate with progression of hepatic metastatic disease in patients with CRC [12, 13]. These factors include primary tumor size as well as number and size of metastases. Several approaches have been suggested to optimize chemotherapeutic treatment of CRC patients with liver metastases. One approach is to test in vitro chemosensitivity of primary tumor cells to determine which regimens the tumor cells are most sensitive to. Additionally, pharmacogenetic markers may be analyzed to facilitate selection of chemotherapeutic agents . Both preclinical and clinical data have suggested that TS expression may be useful for predicting clinical response of metastatic CRC patients to fluoropyrimidine based chemotherapy [15–17]. Several in vitro studies have demonstrated an increased level of TS expression in tumor cells resistant to fluoropyrimidines . Kornmann et al. reported that TS mRNA expression is a predictive marker of response to HAI therapy based on FUDR . However, TS mRNA levels of liver CRC metastases resistant to fluoropyrimidine-based chemotherapy have not been previously compared to levels present before chemotherapy. In the present study, a statistically significant increase in TS mRNA levels was observed in liver metastases from CRC patients resistant to FUDR chemotherapy in comparison to liver metastases from the same patients before chemotherapy (p = 0.03) (Figure 2). In addition, we observed that patients with a low TS mRNA level before chemotherapy achieved a clinical response more frequently (40%) than patients with a high TS mRNA level before chemotherapy (20%). This difference in frequency of clinical response was statistically significant (p = 0.01). These findings support a role for increased TS expression as a mechanism of resistance to fluoropyrimidine based chemotherapy. These results are consistent with previous studies demonstrating that low TS expression predicted significantly longer survival of gastric  and colon cancer patients receiving fluoropyrimidine based chemotherapy [17, 20]. Recently, Gonen et al  reported that TS expression in liver metastases from CRC patients predicted survival duration and extent of disease progression. Conversely, Paradiso et al  did not find any significant association between TS expression level and survival duration. CRC patients in the present study with a low TS mRNA level did have a slightly longer median survival duration than those with a high TS mRNA level. However, this difference was not statistically significant. Although the number of patients studied is relatively small, the results of the present study support a role for increased TS expression as a mechanism of resistance to fluoropyrimidine based chemotherapy. The CRC patients resistant to chemotherapy in which TS mRNA levels were increased in liver metastases after chemotherapy demonstrate this relationship in particular. These findings suggest that it may be useful to consider intratumoral TS expression during choice of therapy for patients with advanced colon cancer. Significant improvements in treatment of CRC patients may be possible by individualizing therapy on the basis of the specific characteristics each tumor exhibits. Massimo Libra, Patrick M Navolanic contributed equally to this work. ML, PMN, and S Travali participated in the experimental and molecular analyses. ML and PMN also participated in the interpretation of results and drafted the manuscript. RT performed statistical analysis. EC, FS, and SM participated in the processing and storage of biological samples. S Tumolo and GT carried out the recruitment of eligible patients. GT conceived of the study and conducted the interpretation of results. MB participated in the study design and coordination. All authors read and approved the final manuscript.